Immunotherapy broadly refers to a variety of techniques used to spur the human immune system to fight disease. The Brown Center for Immunotherapy is particularly interested in the emerging field of cell-based immunotherapies. T cells–a type of immune cell–are extracted from a patient and engineered in a laboratory to recognize specific antigens on tumor cells through the insertion of a “chimeric antigen receptor.” Such modified T cells are known as chimeric T cells, or CAR T cells. Thousands of the CAR T cells are created and infused into the patient’s bloodstream. The cells act as a living drug that hunts down and kills the cancer cells. Importantly, these reprogrammed immune cells survive in the body for years, constantly patrolling for cancer cells and attacking them as they appear. Cell-based immunotherapy is widely considered one of the most promising and exciting potential treatments to emerge in at least a generation. While use of the therapy is still in its infancy, the results of small trials have been remarkable. For example, CAR T cell therapy has been successfully used to treat refractory acute lymphoblastic leukemia, a disease that was previously considered universally fatal. In early trials at University of Pennsylvania, nearly 90 percent of patients treated with the therapy survived. 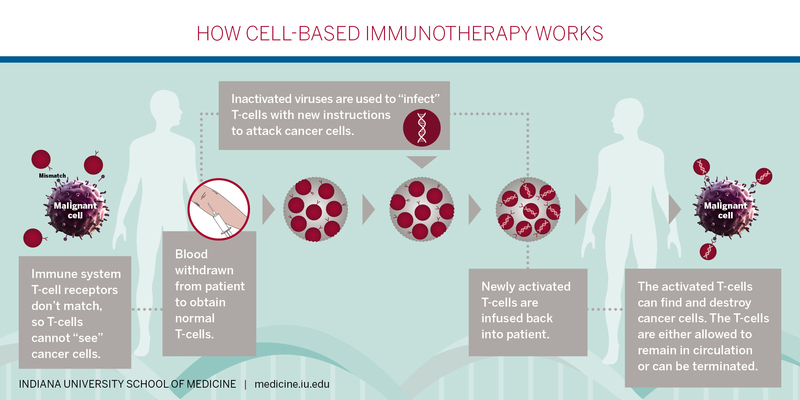 Immunotherapy is a relatively new approach to fighting illness in which a patient’s immune system is energized to more effectively target a disease. What diseases are treated with immunotherapy? The primary target in immunotherapy treatments so far has been cancer. However, there is hope that the developing techniques may be applied to neurodegenerative disorders such as Alzheimer’s disease, as well as other diseases. Several methods of immunotherapy are being tested. At least initially, researchers associated with the Don Brown Center for Immunotherapy will focus on a technology known as chimeric antigen receptor-modified T cells, or CAR T cells. T cells are important cells in the body’s immune system, but often cannot detect cancer cells due to the defenses put up by the malignant tumor cells. In this form of immunotherapy, a patient’s T cells are collected, programmed to identify and attack cancer cells, then re-inserted into the patient. On what diseases will immunotherapy researchers at the Brown Center focus? Two forms of cancer that have proven extremely difficult to treat effectively – multiple myeloma and triple-negative breast cancer – have been selected as initial targets for center researchers. In some cases, immunotherapy has resulted in dramatic, long-lasting improvements in patients for whom all standard treatments had failed – to the point that they were declared cancer-free. In other cases patients improved significantly, but then relapsed. And in some patients, immunotherapy has not shown significant benefit. Are there risks to immunotherapy? All new therapies carry risks. With immunotherapy researchers and clinicians are learning that they must monitor patients closely in case their immune systems, having been energized to fight cancer, then begin to mount attacks against the patient’s organs. In some cases, such immune system attacks have been fatal, or have resulted in chronic diseases such as diabetes. Some new immunotherapy drugs have proven to be extremely expensive. Because the CAR T approach is an early, experimental therapy, the costs are difficult to estimate. Initially, in more widespread use, CAR T therapy will not be inexpensive, though hopefully the costs will drop over time.